Bihar Combine Entrance Competitive Exam Board had conducted the ITICAT (Industrial Training Institute Competitive Admission Test) 2017 in Bihar in June 2017. Many candidates had appeared in the. The candidates can check the Bihar ITICAT Result 2017 here. Bihar Combine Entrance Competitive Exam Board (BCECEB) is formed under the Bihar Combined Entrance Competitive Exam Act 1995. 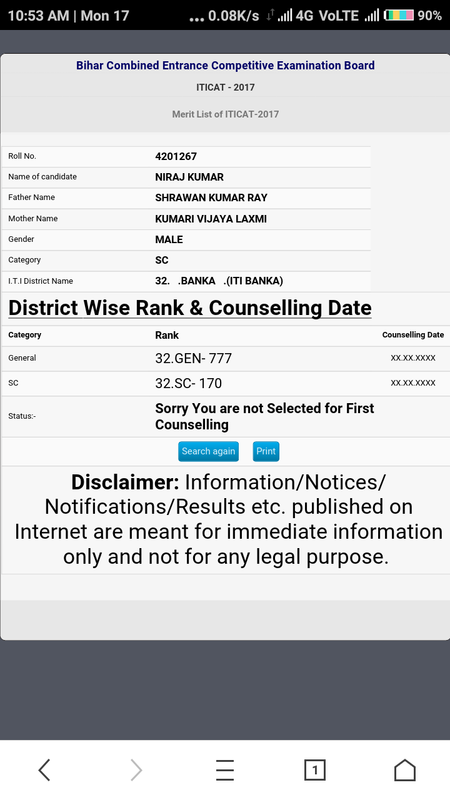 The selection of the candidates for admissions in various ITI’s of Bihar starts well in advance by Bihar Combine Entrance Competitive Exam Board. There are 596 private ITI’s in Bihar with total capacity of 111027 students and 28 government ITI’s in the state. The basic qualification to appear in the test is 10th. Find the link which is BCECE ITICAT Exam Result 2017 from the Notice Board section. Search for your roll number in the list of qualified candidates. Selected Candidates can participate in ITICAT Counseling 2017. Schedule of Counseling will be declared soon on the website . Stay tuned for more updates on Bihar ITI exam.